Looking for a good quality patio heater for your pool deck? In this in-depth buying guide, we are going to review the best natural gas, propane and electric patio heaters for your pool deck. To help you find the best one for your particular situation, we will review different types of patio heaters including standalone models, wall-mounted heaters and table-top fire pits. 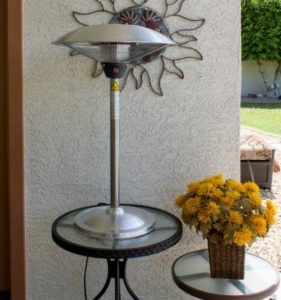 What’s In This Patio Heater Buying Guide? Why Buy a Patio Heater? A patio heater is great if you want to enjoy alfresco dining by your pool deck or hold evening pool parties. You can keep the outdoor space just as warm and cozy as the inside. A patio heater also lets you enjoy your pool deck for longer even after the cold season has set in. A patio heater, whether it’s powered by natural gas, propane or electricity, is a much better alternative to traditional wood-burning fire pits. You don’t have to deal with eye-irritating smoke or clean up soot and ash the next day. These types of heaters are also easy to use and are very low-maintenance. You’ve probably seen this tower heater at your favorite restaurant. The design and high heat output make it a good choice for commercial spaces as well as your pool deck area. 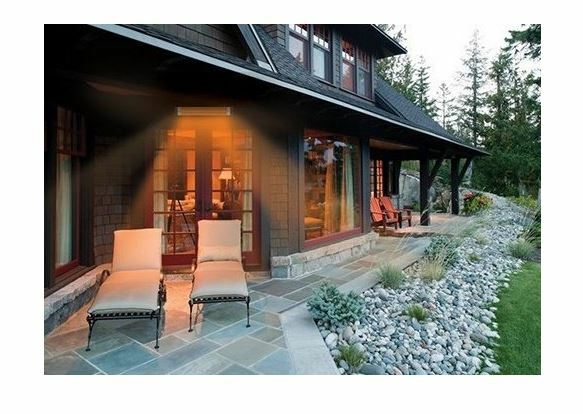 This full-size patio heater packs an impressive 40,000 BTUs of heat output. That’s enough to cover a large outdoor space. The heater is powered by a 20lb propane tank, which you have to buy separately. The tank fits perfectly under the heater behind an easy access door. When the heater is set on high, a full tank will last between 8 to 10 hours. Assuming you are using it for a couple of hours a night, it will last a few days. In addition to providing warmth, the heater is a beautiful decoration piece for the pool deck. At 91” in height, it’s the perfect centerpiece for your outdoor space. The combination of a bronze body and a quartz glass tube looks great against your backyard. When lit up, the heater provides a nice ambiance. Being this tall, it’s obviously heavy. But don’t worry about moving its 65.2lbs weight around. It has wheels at the base for easy relocation. Adequate heat output for small and mid-size outdoor spaces. Beautiful design – it’s as much a patio heater as it is a decoration piece. An anti-tilt mechanism for added safety. Easy portability thanks to the wheeled base. Easy to hook up to a propane tank. The manual is poorly written, making assembly a bit of a challenge. Propane tank requires regular refilling. 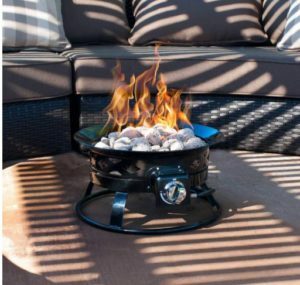 If you are looking for a cozy campfire feel without all the smoke, this tabletop fire pit is perfect. It not only produces beautiful smokeless flames, but it also emits plenty of heat. You can actually roast your marshmallows over the flame. To complete the cozy effect, it comes with decorative lava stones to put in the heater. The heater hooks up to a standard size propane tank. A 5-gallon tank will last about 24 hours and even longer when set on low. The heater sits on a sturdy base with the flames raised safely above the table. The stainless steel burner and body are guaranteed to last long without rusting. We love how compact this heater is. It makes it much easier to move it around. It even comes with a weather resistant bag for storage and transport. When you are not enjoying the heat by your poolside, you can take it camping especially in places where campfires are banned. Hooking it up to a propane tank is easy and quick. A 10-foot hose and regulator are provided. Other than the propane tank, you don’t need to buy anything else. Easy to carry around using the included storage/transport bag. Comes with all necessary accessories including hose, regulator, lid, carrying strap and stabilizer ring for your propane tank. Cozy smokeless flames with decorative lava rocks for an extra-cozy look. Very easy to use – just connect the hose to the propane tank and light it up. No assembly required. The extra-long hose allows you to keep the propane tank at a safe distance. 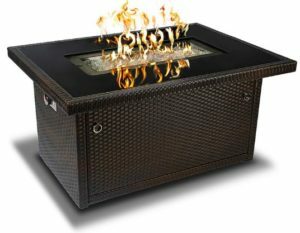 If you prefer a patio heater with more modern styling, I recommend this 35,000 BTU fire table. It is pricey compared to other patio heaters but the design is unmatched. For one, it’s a full-size table with beautiful coffee-colored resin wicker on the sides and a stylish tempered glass tabletop. You can even place items on the glass top. The flames are set safely within a glass wind guard. What we love most about this heater is that it is self-contained. The base perfectly fits a 20lb propane tank (tank not included). A 3-foot hose and regulator are provided for hooking up to the tank. 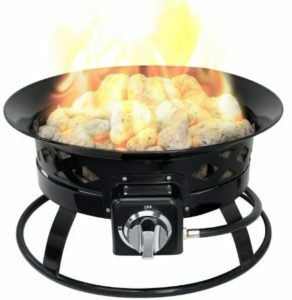 As many users have noted in their reviews, the fire table is very high quality. It’s designed to withstand years of outdoor use without losing its shine. 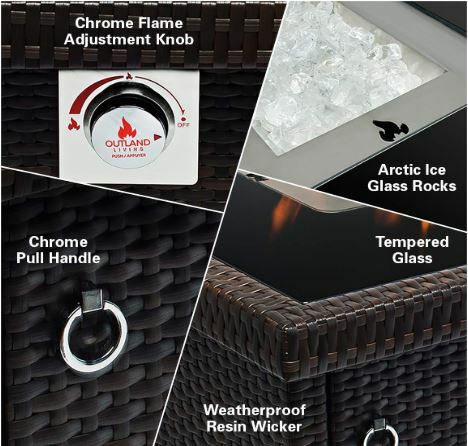 The resin wicker is weather resistant while the sturdy base is made from aluminum framing. The top consists of thick tempered glass that can withstand heat and the elements. Despite the size of the fire table, it’s easy to assemble. But it’s a bit heavy so I recommend having someone around to help you set it up. Great design and construction – it’s well worth the money. A beautiful centerpiece for your patio or pool deck. Completely self-contained – includes a table, secure fire pit area and a base where the propane tank goes. Comes with a windscreen for the fire pit. The versatile – glass top can hold things like plates and wine glasses. Beautiful smokeless flames with ice glass rocks include completing the effect. Pricey (but totally worth it). Doesn’t put out a lot of heat compared to other patio heaters. 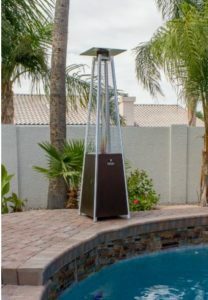 If the pyramid-shaped AZ Patio Heater does not exactly match your style preferences, this 46,000 BTU tower by Golden Flame is a good alternative. It’s just as tall as the AZ heater but has a square style on both the base and the glass tube above it. It also looks just as stylish and a beautiful decoration piece for your pool deck. There are several styles to choose from including rich mocha, hammered silver, and bronze. The heater produces 46,000 BTUs of heat output. This is enough to keep an 8-feet radius around it warm. You can toggle the flame between high and low depending on how cold it is. The heater hooks up to a standard 20lb propane tank that goes inside the base behind an easy access door. The base is extra-wide for added stability and safety. But because of its height, there is still a risk it could fall over when it’s windy. To prevent that, the heater comes with additional space at the bottom that you can fill with water or sand to increase stability especially when the wind picks up. Beautiful design and flame – a good conversation starter for your pool deck or patio. High heat output with adjustable flame controls. Comes with an auto-tilt shut-off system for maximum safety. Despite its size, it’s easy to move around using the wheels at the base. While it is fairly easy to set up, it takes time – around an hour or more. But there is an option to get it installed by an expert. Even with the base filled with sand, the heater still shakes a bit too much when it is very windy. I cannot recommend it for use in areas with frequent strong winds. The biggest advantage of electric patio heaters is that you never have to worry about replacing a propane tank. Just plug it into an outlet and you can enjoy the warmth for as long as you like. 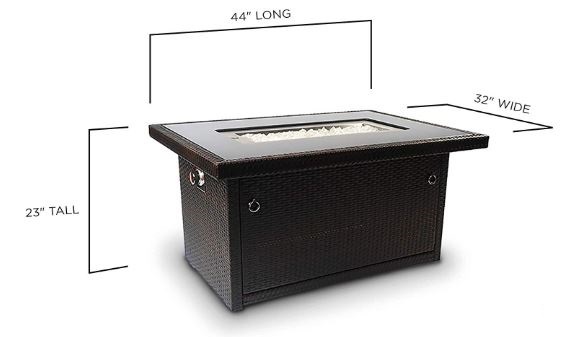 This compact tabletop patio heater is perfect for both indoors and outdoors. It’s rated at 1500 watts, which means it produces about 5100 BTUs of heat output. That’s enough to warm up a 50 square feet area. For best results, place it on the table rather than on the floor. This allows the heat to radiate further outwards. You can adjust the heat using an integrated control hob. The base is weighted to ensure it does not topple over. The entire body is made of stainless steel, making it durable and rustproof. The heater is also certified waterproof so you don’t have to take it inside if there is a bit of rain or snow. Installation is easy. It takes 15-30 minutes. You can plug it into a standard 120v outlet. The heater draws a lot of power so don’t plug it into a power strip. It could trip your circuit. Easy to install and maintain – doesn’t have the hassles of a propane heater. Produces enough heat for a small to the mid-size outdoor seating area. The bulb is a bit too bright. You have to position the heater in such a way that it doesn’t blind you. May not feel very warm for cold or windy areas. You don’t have to spend a lot of money on a decent patio heater for your pool deck. The construction is not as solid as their other pyramid tower heater that I reviewed but it is good enough for most people’s needs. The heater comes partially assembled so it should take you 20-30 minutes to finish putting it together and hook it up to a 20lb propane tank. The base is pretty sturdy but there’s a space to add sand to increase stability. But unless you live in a windy area, you’ll probably not need the sand. With the heater fully assembled, it measures 87 inches tall from the base to the deflector on top. It produces 41,000 BTUs of heat. That’s good enough to heat a radius of 4-7 feet depending on the ambient air temperature and wind speed. For cold or windy areas, sitting closer to the heater helps. The heater comes with a bonus table where you can place your drinks. The table can be secured at any height along the top part of the tower. You can also remove it completely when not using it. Wheeled base for easy mobility. Takes a few tries to get a hang of how the control dial works. Construction quality is not the best – not suspiring considering the price. If you have an umbrella or parasol on your pool deck, this is the best heater. It is designed to secure under an open umbrella where it provides plenty of overhead warmth. The heater consists of 3 burners with a total heat output of 1500 watts or around 5100 BTUs. That’s enough to warm an area of around 15 square feet. It’s easy to install on your umbrella and equally easy to remove. It plugs into a standard 120V outlet. It is certified waterproof so don’t worry about rain and snow. The panels do get quite hot so make sure you install it high enough that your kids cannot reach it. Doesn’t warm your feet and legs if you are seating at a table. The overhead warmth only reaches your upper body. Produces a slight humming sound. But it’s not loud and you won’t even notice most of the time. If you don’t have enough space on your pool deck to set up a tower heater, a wall or roof mounted heater is the best alternative. This 1500 watt heater can be installed on the wall or ceiling using the included universal mounting bracket. The 6-foot cord is long enough to reach the nearest outlet. 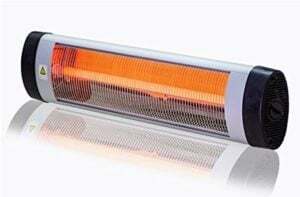 This is an infrared heater. It works differently from traditional electric heaters. Instead of heating the air around it, as other electric heaters do, it transfers heat directly to people and objects around it. It can heat a larger area much efficiently. This heater warms up a radius of 6-8 feet. For maximum warmth, consider installing it a bit lower on the walls to increase heat distribution. One thing you’ll love about using this infrared heater is that it is completely silent. There isn’t that annoying hum you sometimes get from conventional electric patio heaters. But I wish they had included a remote control. The only way to control heat is by using a dial on the heater itself. So be careful not to install it too high where you cannot easily reach it. At least this one comes with remote control. But what we love most about it is the fact that you can set it up in three different ways depending on your situation. A mounting bracket lets you install it on the wall or ceiling. It also comes with an offset pole that lets you set it up as a freestanding heater. The last option is ideal if your pool deck is not near a wall where you can mount the heater. However, you decide to install it, set up is easy and quick. It is an infrared heater. So it operates more efficiently and heats a larger area than traditional electric patio heaters. The remote control lets you adjust the heat without standing up to touch the heater. You can set one of three heat modes. There is also a timer function. Works better in windy conditions compared to other types of electric heaters. Many customer complaints regarding construction quality. Don’t expect it to last very long. Most patio heaters are not just for warmth. 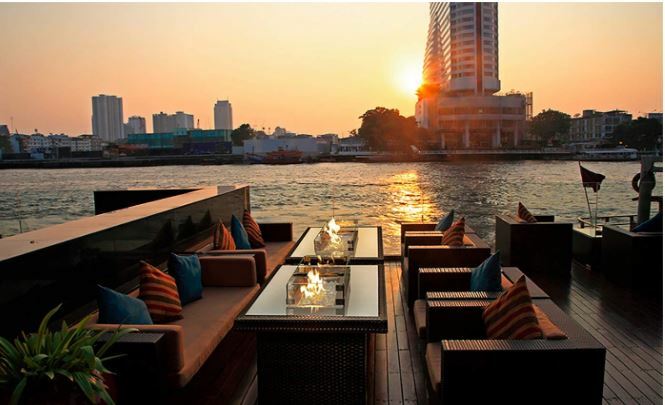 They also make for good decoration pieces and add a nice ambiance to an outdoor space. This tower heater is an especially cool-looking conversation starter. It has a unique pyramid shape that rises to a height of 90 inches. It’ll definitely make a statement on your pool deck. It consists of a wide stable base and a ceramic-glass heating column on top. The glass is surrounded by a protective mesh that adds to its stylish look. But what’s most impressive is the flame that shoots up into the glass tube, creating a cozy ambiance around the heater. You can control how high and intensive the flame is using a knob on the base. The heat output is rated at 38,000 BTUs but it can go as high as 42,000-45,000 BTUs at peak output. When set on high, the heat easily covers a 5-7 feet radius. The heating radius shrinks a bit when it’s cold to around 3 feet. As with most of these tower-style heaters, the assembly is easy but takes time. Block 45 minutes to one hour in your schedule to finish assembling and setting it up. You can assemble it in the house and then wheel it out to the pool deck or patio. It hooks up to a 20lb propane tank that sits in the base. Other than the tank, all other accessories are provided including a flexible hose and gas regulator. Available in 3 colors: black, mocha and stainless steel. Stylish design and great ambiance. Anti-tilt auto shut-off feature for maximum safety. Flame and heat adjustment controls. Easy mobility thanks to the wheeled base. The reflector on top is a bit small. This limits the heater’s reach, especially on cold days. Assembly and set up takes a bit of time, which is normal for these types of patio heaters. 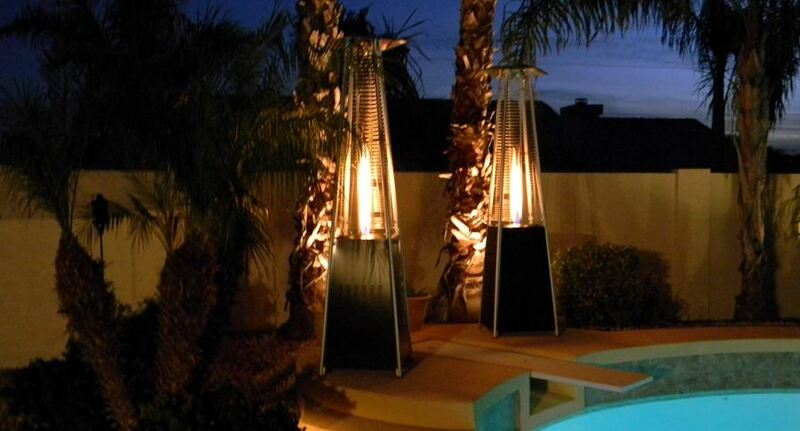 Here are the most important factors to consider when you are choosing a patio heater. The larger the area you want to warm up, the more powerful the heater you need to get. For large pool decks, a tower heater is usually the best option. Some can produce up to 48,000 BTU of heat. If it is a small sitting area that is partially covered, consider a tabletop or wall-mounted heater. Most patio heaters use propane. You’ll have to buy a propane tank separately and refill it often (they don’t last very long). Propane heaters are great for portability and ease of set up but are expensive to operate. If you don’t want the hassle of constantly refilling a propane tank, get a natural gas heater that you can hook up to your home’s supply. Natural gas heaters are the cheapest to run but set up is involving since you have to connect it to your gas line. Portability is also limited. Alternatively, buy an electric heater. You simply need to plug it into an outlet. The main downside with electric heaters is that they don’t produce as much heat as propane and natural gas heaters. If they did, you’d probably have to hardwire it rather than just plugging it into an outlet. Electric heaters also have limited portability since you cannot go too far from an outlet. 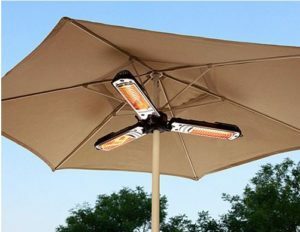 There are several types of patio heaters. The best one depends on your heating needs and style preferences. Freestanding: These heaters are set up on the ground. If they use propane, the tank can be hidden in the base. Freestanding heaters are ideal for heating large areas since they produce more heat. They are also a great choice if you need something that makes a statement. Wall-mounted: Wall-mounted heaters are typically electric. They are ideal when you need to heat a small or mid-size area or when you don’t have a place to set up a freestanding heater. Note that most wall-mounted heaters can also be mounted on the ceiling. Tabletop: If you want to warm a small sitting area where everyone sits around a table, a tabletop heater is perfect. It creates a nice cozy ambiance while producing enough heat to keep everyone warm. Tabletop heaters usually use propane. But you have to set up the propane tank far away and deliver fuel to the heater using a long hose. This can sometimes look a bit unaesthetic. Hanging: Hanging heaters are installed on the ceiling like a chandelier or fan. They are great for heating small areas that are partially covered. 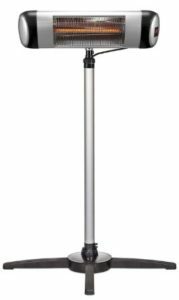 Umbrella heaters: An umbrella heater works great with a patio/pool deck umbrella or parasol. You install it on the shaft of the umbrella such that it warms you from the top. Most umbrella heaters are electric. Self-contained table heaters: If you like the look of tabletop heaters but are not a fan of the whole extended hose thing, consider getting a full-size table heater. The entire table is the heater. The propane tank goes in a base underneath the table and the flames shoot out from an island at the top of the table. Calculating the exact number of BTUs you need works great for indoor heaters. It’s not as easy for outdoor heaters. This is because there are many other factors other than space that affect how much heat you get from the heater. You may have a powerful heater but still not get a lot of warmth because of too much wind that carries the heat away. Most heaters also don’t work very well in very cold temperatures. Here’s how to determine the best heating capacity. 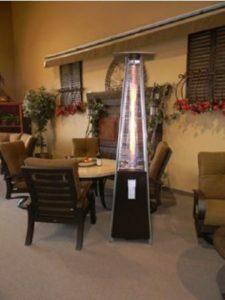 If the seating area is spread out over a large area (maybe you have 5 or more lounge chairs along the pool deck), get the most powerful freestanding heater you can afford. Anything between 45,000 BTU and 60,000 BTU is good. You can also opt for two smaller-capacity heaters for better heat distribution. If the seating area is smaller (maybe a couple of lounge chairs), a 30,000-45,000 BTU heater will work well. If the seating area is partially covered, you can even get away with a 1,500 watts (around 5,100 BTU) wall-mounted electric heater. If the entertainment area consists of chairs set around a table, a 10,000-30,000 BTU tabletop or umbrella heater will do. Another way to determine the ideal heating capacity is to estimate how far everyone will be from the heat source. The most powerful heaters (40,000-60,000 BTUs) can warm a radius of 9-15 feet. Smaller electric and tabletop heaters are adequate for a radius of 3-7 feet. Propane patio heaters are relatively easy to set up and you can install them anywhere. You just need to assemble the heater and then hook up a 20lb propane tank. The problem with using propane is that it burns up fast. With the heater set on high, a full tank will last just 8-10 hours. If you use the heater every day, the costs can add up quickly. The main issue with natural gas heaters is the amount of work and costs involved in setting up. You have to have it professionally installed. You also cannot set it up anywhere or move it after installation. But once you’ve installed it, a natural gas heater is much cheaper to run. You also don’t have to worry about constantly refilling or buying new propane tanks. Portability is not an issue with most patio heaters, even the big ones. That’s because most come with wheels at the base. That makes it easy to move the heater around on your own. If you need something you can carry around by hand or take with your camping, get a tabletop or an electric heater. Here are the basic safety features found in most patio heaters. – Stable base to prevent tipping over especially when it is windy. – Waterproof construction – this one’s especially important for electric patio heaters. – Auto tilt shut-off mechanism. This feature automatically shuts down gas supply if it detects that the heater is tipping. Most patio heaters have just one dome at the top. The dome reflects rising heat back down and outwards. Triple dome heaters, which are more expensive, have a series of three reflective domes at the top with the lowest one usually being the smallest. This triple configuration increases heating efficiency by preventing heat loss and reducing the effect of wind. A triple dome heater can spread more warmth over a larger area compared to a single dome heater. Patio heaters work by producing heat and then spreading it as far out as possible. To produce heat, they need fuel. Electric heaters use electricity to power a heating lamp. Propane heaters burn propane while natural gas heaters burn natural gas. Unlike most indoor heaters, outdoor patio heaters are not fan-forced. There is no fan spreading the heat around. Instead, most produce radiant heat. They heat the air around them and then the air warms you up. Some electric heaters are infrared. They transfer heat directly to your body without heating the air around. To spread the heat and prevent it from escaping upwards, patio heaters have reflective domes. The dome reflects rising heat downwards and spreads it out over a large area. In almost all heaters, you can control how much heat it produces. Install the heater as directed by the manufacturer. Read the user manual before you begin the installation. It will tell you the safest place to set up the heater and how to connect all the fittings. Do not install the heater near anything flammable or anything that can melt easily such as vinyl or nylon. Make sure the heater is stable and won’t easily tip over. Set it up on a flat area. In most cases, putting the propane tank in the base is enough to stabilize the heater. With some heaters, you have to add water or sand at the base for added stability. Teach your kids never to play with the heater. Even if it won’t tip over, it can get very hot. Even electric heaters do get hot. Also, watch out for pets. Make sure the heater has an automatic tilt switch off feature. Do not put things like clothes or towels on the heater. They can easily catch fire. Watch out if you live in a very windy area. Even a stable heater can tip over in strong winds. If it gets too windy, take the heater inside. Turn off the heater when it’s not in use. Never leave the heater on when you are going somewhere. Some electric heaters have a timer function that is handy in case you forget to turn it off. Never use an outdoor heater indoors or an indoor heater outdoors. An outdoor heater can be hazardous indoors while an indoor heater can easily get damaged by water when used outdoors. If you want a versatile heater that you can use anywhere, look for electric models labeled as indoor/outdoor heaters. How Much Does It Cost To Operate a Patio Heater? A natural gas heater is the cheapest to operate. It will cost you about $0.50 an hour for a 40,000 BTU heater. A propane gas heater is the most expensive. It will cost you about $1.70 an hour for a 40,000 BTU heater. Electric heaters fall somewhere in between but can sometimes be cheaper than natural gas heaters. For a 4,000-5,000 watt heater, costs come to about $1.40 an hour. The more common 1500-watt heaters cost about 30-50 cents an hour to run. Don’t forget to include the initial cost of buying and installing the heater. 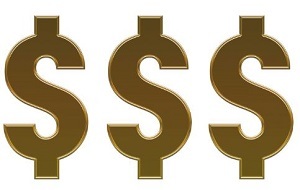 Installation costs apply only for natural gas heaters. But you can also ask a pro to assemble and install an electric or propane gas heater for you. If you buy a propane heater, don’t forget the refilling/exchange costs. How Much Clearance Do I Need Around My Patio Heater? The standard clearance for most heaters is around 30 inches for large heaters and 24 inches for smaller ones. This includes clearance at the top and around the sides. Read the user manual for precise figures. Adequate clearance is very important. If the heater is obstructed by a wall or object, toxic gasses could build up or a fire might start. Having objects too close to the heater can also cause melting or heat damage. 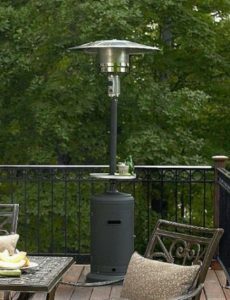 Where Can I Safely Operate a Free-Standing Patio Heater? The best place is outdoors on a flat area. This ensures the heater has enough clearance space around and that there’s no fire hazard. If you want to use the heater in a partially covered patio, check the manual or ask the manufacturer if it’s okay. It might be safe if the patio is open on two or three sides including the top. But check with the manufacturer first. As for where to place the heater, it should be on the flat hard ground like tile or pavement. This ensures it stays flat and doesn’t tip over.